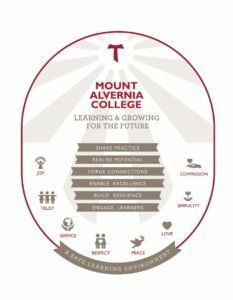 At Mount Alvernia College it is our aim to nurture a culture of learning. The focus on maintaining and strengthening the learning and teaching environment to ensure all members of the community are active learners is considered paramount to our success. We have established and continue to develop programs, learning experiences, opportunities, processes and physical spaces that ensure a safe and supportive learning environment. By intentionally learning from the past, we focus on the present and ensure that we are enabling our learners to prepare for their future, one that will require a unique skill set. With our Franciscan values overarching all that we do, our Learning and Teaching Framework provides the professional platform for our learning approach and how we implement it within the College. Of all of these, our key intent is to engage learners as this will ensure success at every level and stage of our young women’s Mount Alvernia journey. Promote a sense of belonging among students by encouraging and recognising diverse expressions of competence and expertise. Our Learning and Teaching framework has been developed by a committed team of teachers and leaders, under the guidance of our Assistant Principal – Student Learning, Debra Evans. In her current role as Assistant Principal – Student Learning, Mrs Evans is responsible for the oversight of all learning within the College, with a particular focus on the implementation of the Learning and Teaching Framework, tracking of student learning and analysis of data to inform school growth and development.